BOSTON - The Boston University men's ice hockey team scored four special-teams goals en route to 7-2 home win over Merrimack on Monday at Agganis Arena. The Terriers, who potted three power-play goals and a shorthanded tally, extended their win streak in Hockey East play to four games and improved to 9-9-3 overall and 8-5-2 in Hockey East play. Sophomore David Farrance had his first two-goal game as a Terrier while junior Patrick Harper had a goal and two assists. Senior Ryan Cloonan and graduate student Max Willman each scored his first goal of the season. - Merrimack opened the scoring 8:50 into the first on a goal by Chase Gresock. - BU knotted it up on its first power play of the night on a blast from the center point by Farrance on assists from Harper and junior Patrick Curry. - The Terriers took the lead and never let it go as Cloonan poked in his own rebound at the crease with just under a minute to play in the opening period. 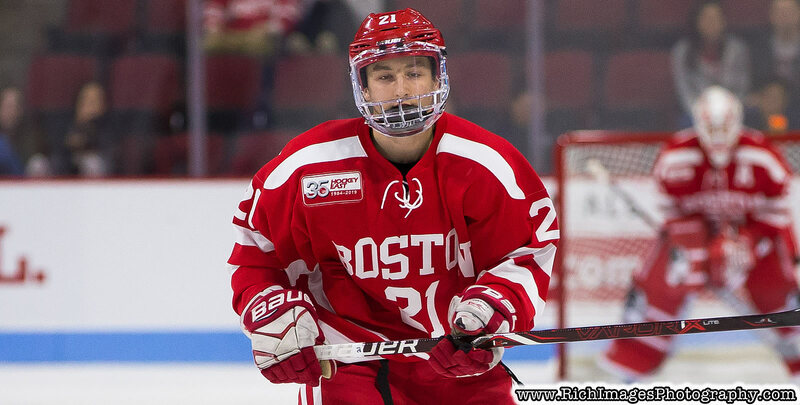 - Willman became the seventh Terrier this season to score a shorthanded goal when he took advantage of a Merrimack miscue and finished off a breakaway midway through the second for a 3-1 lead. - Harper punched in a rebound to push the lead to 4-1 at 13:17. - Just 20 seconds later, Merrimack's Logan Drevitch converted a breakaway along the left side to make it a 4-2 contest. - BU tacked on three more goals in the third to put the game away. - Farrance put the finishing touches on the win with a shot from the left circle off a good look by Harper with 9:35 to play. - BU outshot Merrimack, 42-32, and held a 36-19 advantage in face-offs. - The Terriers went 3-of-4 on the power play and killed off all six of Merrimack's man-up chances, including a five-minute major in the third. - Cloonan ended a streak of 97 consecutive games without a goal, dating back to November 2015. - Willman, who transferred from Brown, scored his first goal as a Terrier and the 17th of his career. - The Terriers will welcome No. 17 Arizona State to Agganis Arena for a weekend series on Jan. 25-26. - Game time on Friday is 7:30 p.m. while Saturday will be a 7 p.m. Start.